Some of the most difficult mold to notice are the ones you can't see. Like underneath cabinets, behind walls, on top of ceiling panels, and much more. This photo was taken shortly after crews removed the ceiling grid after a large loss water damage. Mold growth has already started to begin, yet was hard to notice behind a layer of vinyl. This can not only be frustrating for homeowners but more time and money consuming. Yet, removing all traces of mold from your home or business will ensure higher air quality and reduced health concerns. Don't hesitate to call SERVPRO if you notice mold growth from your ceilings. SERVPRO of Central St. Petersburg / Pinellas Park does more than just water clean up, we also do general cleaning! Whether you are moving in, moving out, or find yourself in a sticky situation with an evicted tenant, we can clean your property and make it "Like it never even happened." 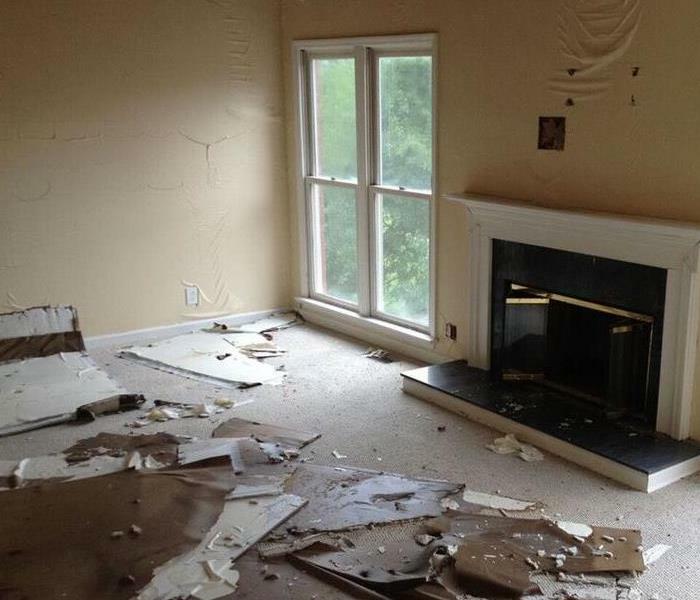 This was the aftermath when a tenant was evicted by their landlord. Crews were called in to clean out this bedroom to preloss condition. The landlord was thrilled with the results and how quickly we were able to clean the room before new tenants moved in. For more information on SERVPRO's general cleaning check out http://www.SERVPROcentralstpetersburgpinellaspark.com/cleaning-services. Our next equipment spotlight is the SERVPRO Air Mover. Air movers are an essential tool for water restoration jobs. They offer high-velocity airflow, which leads to faster drying times to help get the job done quicker and more efficiently. Professional grade air movers are used to improve air circulation to speed up evaporation and reduce drying times. This helps get your home or business back together and running smoothly. Simply put, air movers are heavy duty industrial fans used to speed up the drying process due to water damage, whether caused by heavy storms, flash floods, hurricanes, leaky pipes, etc. 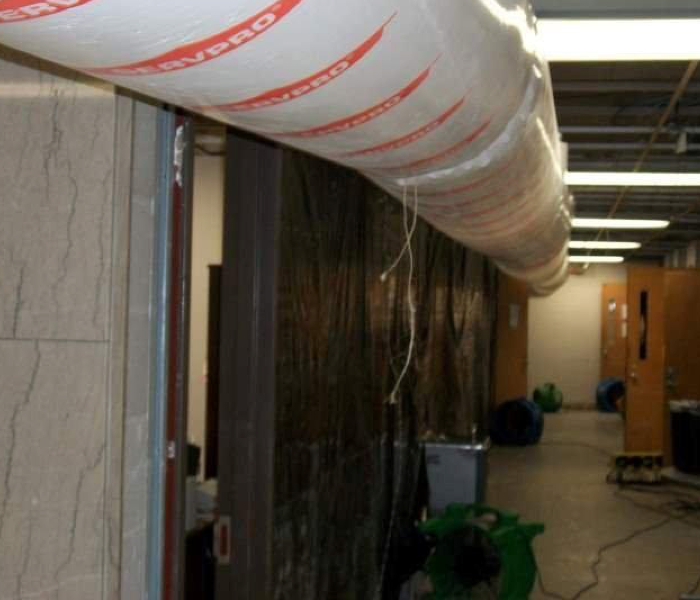 Our air movers may also be used to help keep moisture down after mold remediation. Have more questions about SERVPRO's specialized equipment? Learn more at http://www.SERVPROcentralstpetersburgpinellaspark.com/advanced-technology. SERVPRO of Central St. Petersburg / Pinellas Park uses specialized equipment to get your home back together after a disaster. One of those tools is the Protimeter or moisture meter. They allow us to read any material for water and moisture. As seen in this photo, this wall was 99.9% affected, resulting in the red light going off. Industry standards calls for less than 17% moisture in order for it to be dry, resulting in a green light. Anything in the middle would report back "At Risk" and a yellow light. Moisture meters allow our technicians to pinpoint where the water begins and where the water ends. To learn more about SERVPRO's specialized equipment check out http://www.SERVPROcentralstpetersburgpinellaspark.com/water-repair-process. SERVPRO of Central St. Petersburg/Pinellas Park is a proud member of the SERVPRO Commercial Large Loss Division. The SERVPRO Commercial Large Loss Division is composed of our best of the best in restoration. Our elite large-loss specialists are prequalified and strategically positioned throughout the United States to handle any size disaster. Every large loss is supervised by a commercial operations manager to help ensure seamless communication and timely mitigation. At SERVPRO, the difference is our ability to dispatch trained production professionals and cut costs through the strategic placement and oversight of temporary labor. Whether it's a one room office or a 20 story skyscraper, Get the professionals, call SERVPRO at (727) 521-2562. Mold is not always visible which can be frustrating for homeowners when their mold issue is worse than previously expected. Mold growth can occur behind walls, underneath carpet, inside drawers and cabinets, and around furniture. That was the case in this St. Peters home where mold growth extended behind the wall resulting in crews cutting out drywall and removing insulation. If you suspect that your home or business has a mold problem, SERVPRO of Central St. Petersburg / Pinellas Park has the training, equipment, and expertise to handle the situation. Major storms in January 2018 caused this high-rise in Downtown St. Petersburg to flood down every floor. SERVPRO of Central St. Petersburg/Pinellas Park was on the scene for cleanup. Crews noticed large spots of black mold behind doors and inside closets where moisture has sat for days. The first 48 hours is critical after a water damage to prevent the spread of mold. SERVPRO was able to eliminate and prevent the growth of the mold and make it "Like it never even happened." Give SERVPRO a call today at (727) 521-2562 24 hours a day, 7 days a week. 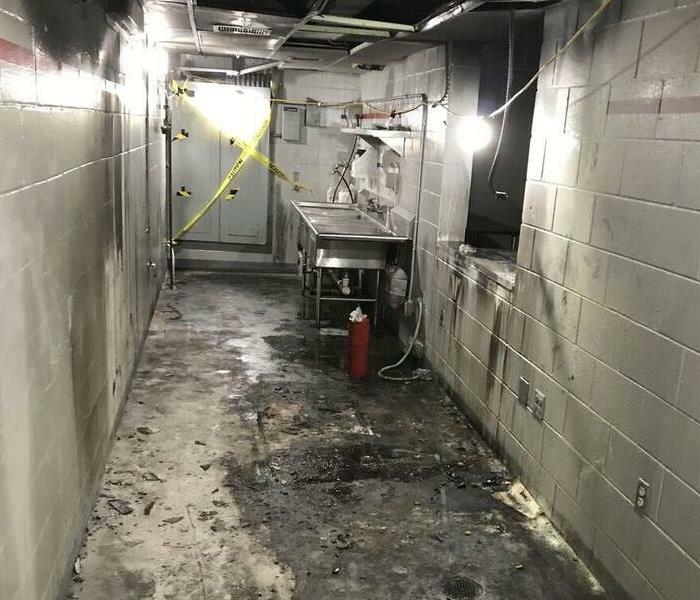 This was the aftermath of a concussions kitchen fire at Tropicana Field. No one was injured during the fire, however there was a lot of damage especially in the back hallway which is shown above. SERVPRO of Central St. Petersburg/Pinellas Park arrived on the scene to assess the significant smoke and soot damage. 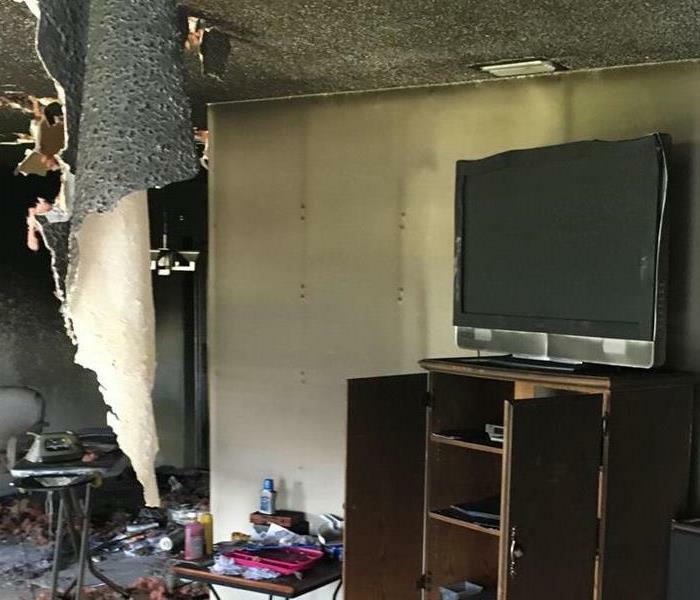 Crews applied SERVPRO approved fire products and equipment to every inch of the affected rooms and made it "Like it never even happened." If the Rays can trust us with their fire damage, so can you! Give us a call to get an estimate at 727-521-2562. 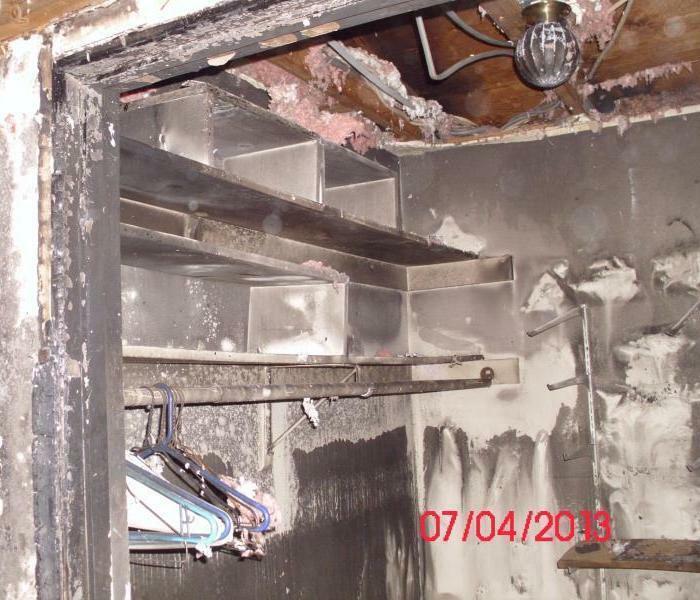 An electrical outlet malfunction is a common factor in house fires. That was the case in this fire. Luckily, the homeowners were not home when an electrical wire burst into flames, consuming most of the house. The fire department considered the house to be a total loss which meant SERVPRO would perform a total remodel of the home. 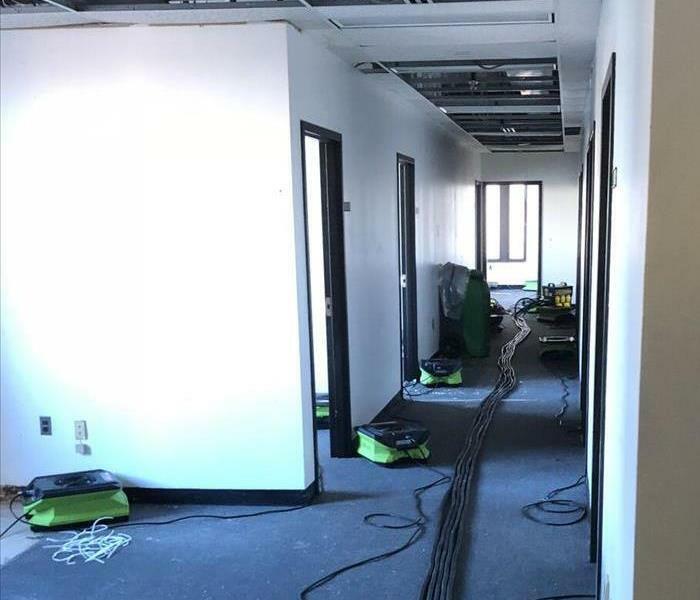 Crews removed ceilings, walls, flooring, and furniture before cleaning the structure with specialized SERVPRO approved products. Our customer was very pleased with the work we preformed and loves their new home! Give SERVPRO of Central St. Petersburg/Pinellas Park a call today! A small roof leak can be disastrous for your small business. Luckily, SERVPRO of Central St. Petersburg/Pinellas Park is there for all your storm related needs! Crews arrived to a wet ceiling and insulation from the attic. SERVPRO was able to tear out the wet ceiling and remove any affected insulation. Our customer was very thrilled with our quick response time and courteous technicians. If your home or business experiences any storm damage, don't stress! Give SERVPRO of Central St. Petersburg/Pinellas Park a call at (727) 521-2562 or visit our website at http://www.SERVPROcentralstpetersburgpinellaspark.com. As a property owner, a large water damage can be disastrous. This was the scene when crews arrive to an empty rental home in Central St. Petersburg. The roof was unable to handle the long night of storms as walls and ceilings fell apart. Notice how wet the ceiling is and the bubbling of the walls. This pattern was pretty consistent throughout the house. Crews got to work removing most of the walls and ceilings before drying the structure. If you ever find yourself in a situation like this, don't worry! Give SERVPRO of Central St. Petersburg/Pinellas Park a call at (727) 521-2562. Sometimes, SERVPRO rescue mats can be used in certain water damage situations. When tear out is out of the question, technicians must be approved before laying down rescue mats. This is because rescue mats are not always 100% effective. 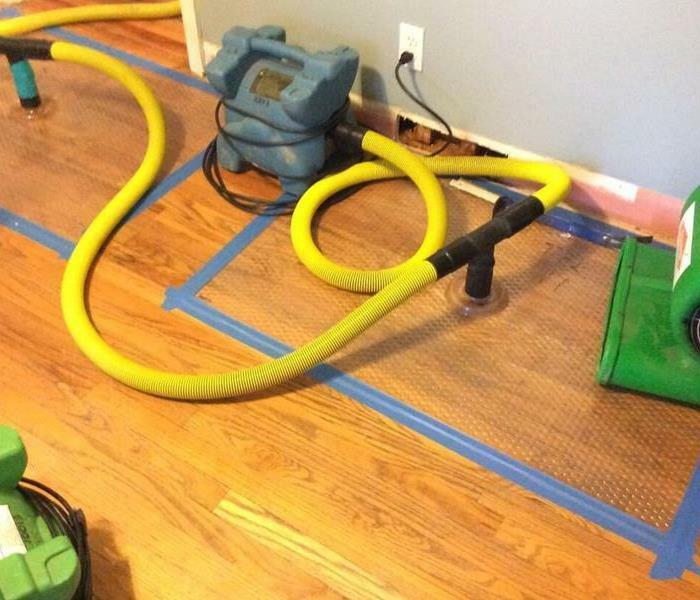 Attached to a dehumidifier, tubes are connected to the mats which allows for water to get sucked from the grout. While this process takes longer because the water is not fully exposed, it may just save your lovely hardwood. Give SERVPRO of Central St. Petersburg/Pinellas Park a call at 727-521-2562 or ask one our technicians if using rescue mats on your hardwood flooring is right for you. 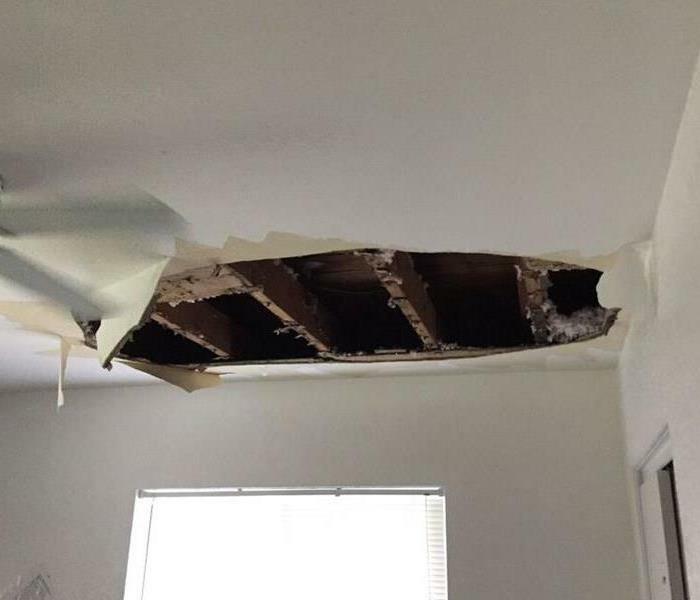 Heavy storms over the weekend caused this Pinellas Park home's roof to collapse, allowing rain water to flow from the attic into the master bedroom. Because the water sat for the weekend, mold was starting to grow on the edge of the wall. SERVPRO of Central St. Petersburg/Pinellas Park began the mitigation process by tarping the roof before going inside to remove the wet ceiling and insulation. Our customer was very thrilled with the quick response time and results. No job is too large for SERVPRO. Give us a call for all your storm related needs at (727)-521-2562. 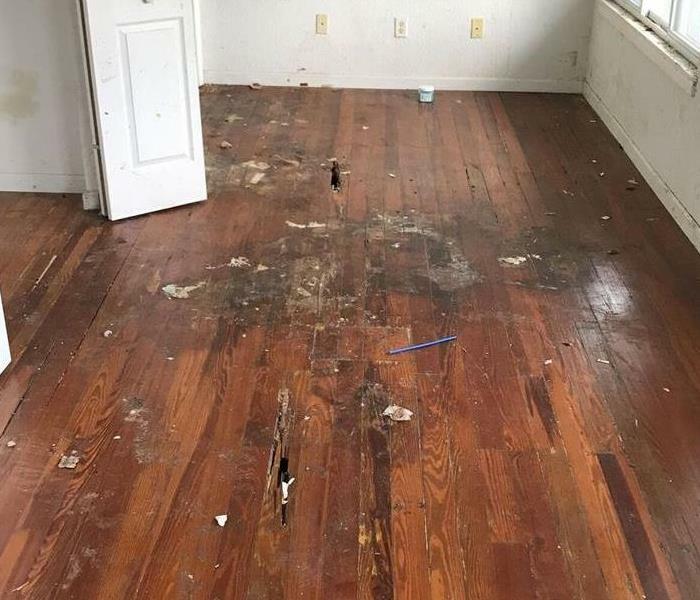 Often when water soaks through your hardwood floors, it is necessary to tear it out. 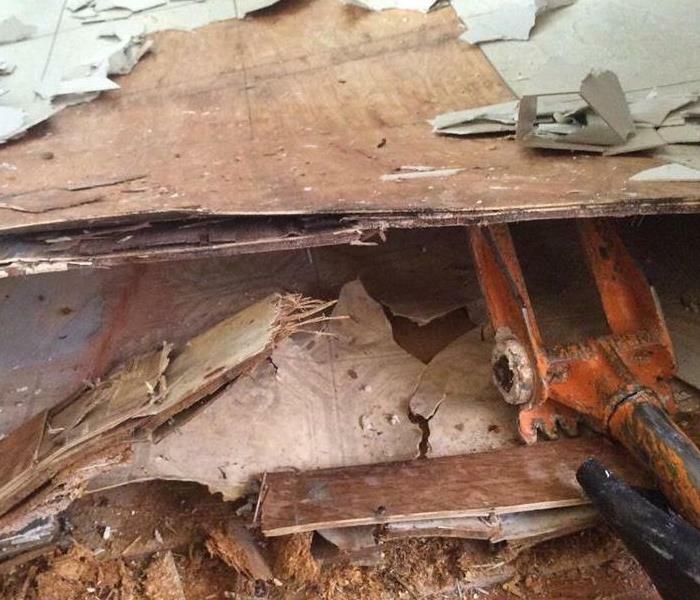 That was the case when crews were instructed to tear out all affected flooring in order to expose the source. This included the vinyl and particle board in order to reach the subfloor. The homeowner couldn't believe how quickly we were able to remove the flooring and dry the subfloor in less than 3 days! We make disasters "Like it never even happened." Give SERVPRO of Central St. Petersburg/Pinellas Park a call for all your water-related needs 24 hours a day, 7 days a week at (727) 521-2562. This was the aftermath of a water damage in Central St. Petersburg. 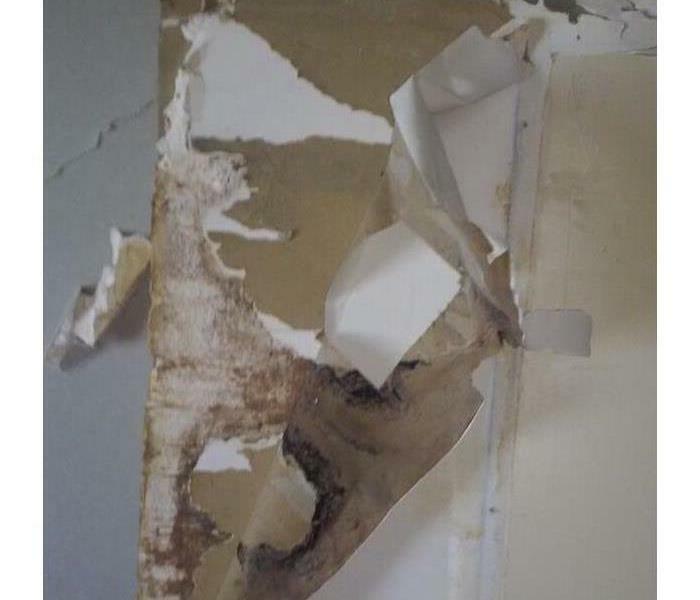 When crews tore through wet drywall to expose the piping, along came mold. Notice how heavy the spores are near the pipe and down the wall. SERVPRO of Central St. Petersburg/Pinellas Park went to work tearing out all affected drywall and apply antimicrobial to the area. The owner couldn't believe how much mold was behind the wall and how quickly SERVPRO was able to assess the issue. Give us a call today for all your mold remediation needs at (727) 521-2562. We make disasters "Like it never even happened." A new SERVPRO customer called in with a concern his shower was leaking. With further inspection SERVPRO found the water was coming from his roof after the hurricane damaged a few roof tiles. After months of water coming in from the roof every time it rained, there was major damage to the wall studs along with drywall. The pro's at SERVPRO had the affected materials removed and a roofing contractor was called to seal up the roof. In no time the customer was back to a dry home and new shower. After a local St. Pete man found a branch from the storm broke his window, there was no time before the rain water rushed in and flooded his home. 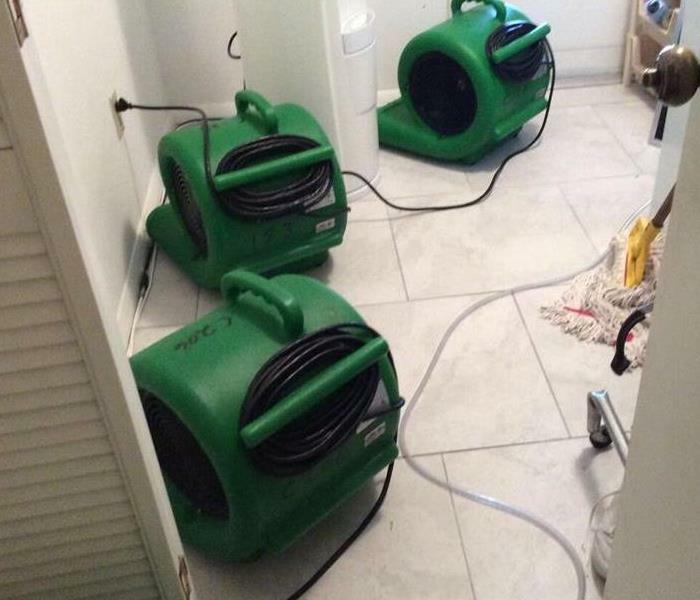 When SERVPRO arrived the whole unit was flooded just from a 20 min down pour. 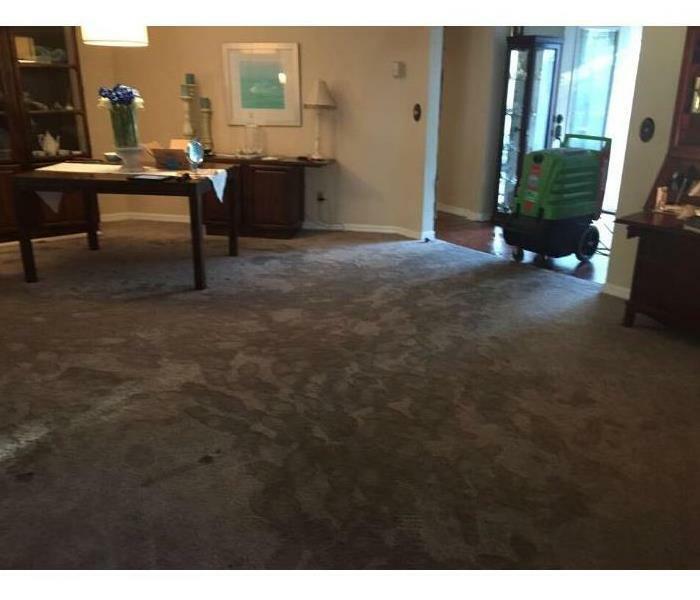 With water extraction and proper drying equipment in place, SERVPRO saved the unit and left with a very happy and thankful customer. The St. Pete area experiences heavy down pours at times. One rainy day a local resident discovered the drains outside stop working properly. Water started moving into his home and before he knew it water covered the whole unit. 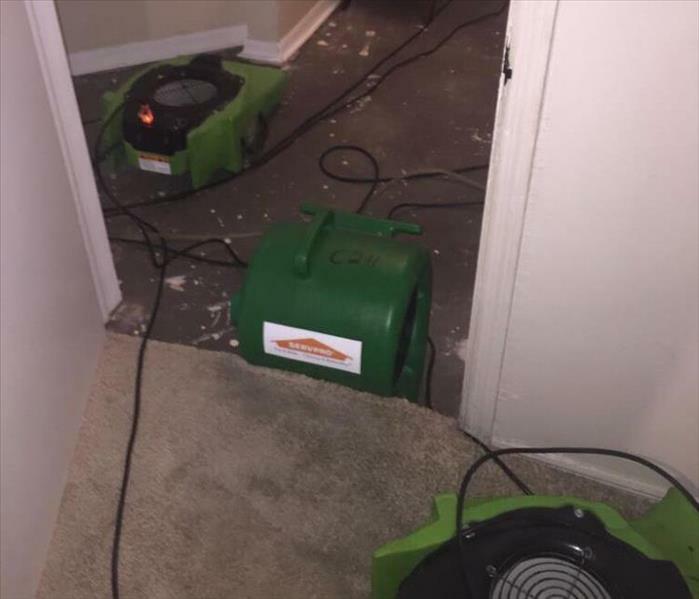 With one call to SERVPRO of Central St. Petersburg and Pinellas Park the customers unit was extracted of all water and air movers set to start the drying process. 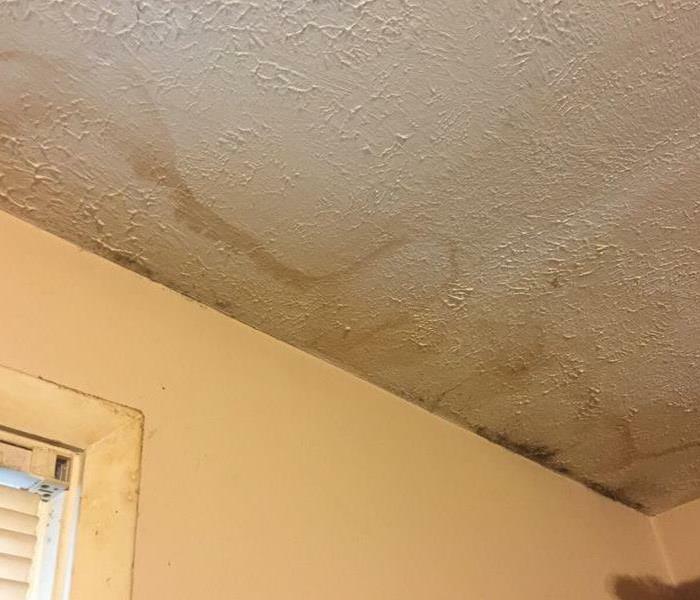 After a water damages occurs there are steps SERVPRO takes to make sure your home does have a chance to grow mold. That is also when SERVPRO inspects the home for visible mold growth. If growth is found the customer is updated and pointed in the right direction to get the problem taken care of. The pro's at SERVPRO have endless knowledge to handle any size disaster weather it be fire, water or MOLD. 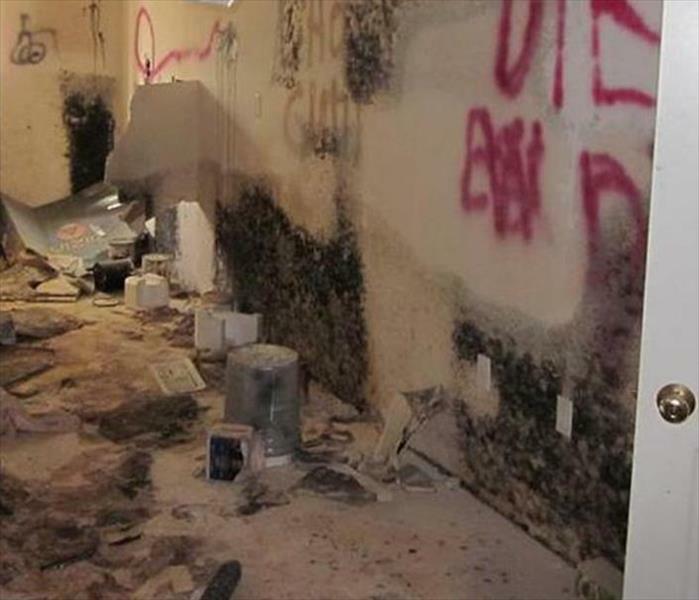 When a concerned Pinellas Park resident found what they thought was mold growth, they called the pro's at SERVPRO. Patrick went out and put eyes on the affected area and took the proper steps and got an industrial hygienist involved with a protocol. Thanks the time SERVPRO follows the recommendations from he hygienist to remove all growth from home. 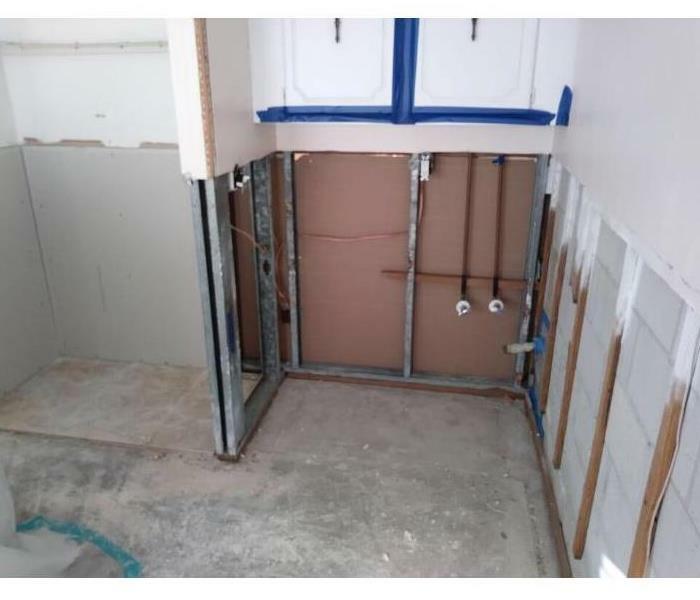 After a commercial customer calls SERVPRO and the team moves in, the project manager directs the crew to start checking walls for wet tracks, drywall and insulation. If the PM does not fill the area can dry in a timely manner the affected material will be removed to assure the customer all the water has been removed. When a pipe broke in this public library one of the employees knew just who to call. After water extraction, the team moved in with fans and dehumidifiers to get all the book shelfs and walls dry. Any troubled areas the teamed removed the affected materials and contractors put back new dry materials. When a fire is put out and everyone is safe you then see the damage of the fire. A blanket of soot covered this local St. Pete warehouse. When Extreme Team Nicholson moved in, there skilled cleaners took over and shined the warehouse back to new. Fires happen at unexpected times and they move quick. Weather it be a fire that you can extinguish your self or one that the fire dept. is needed. 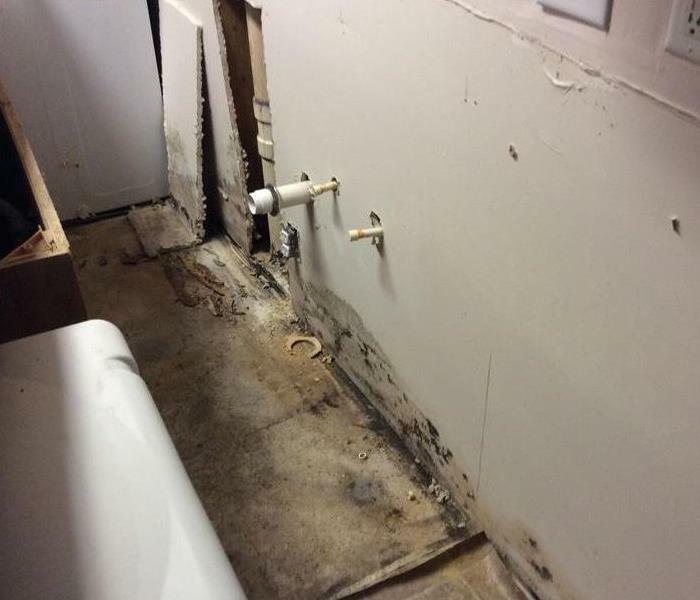 After the flames were put out in this rest room, SERVPRO moved in and removed all soot from walls and cleaned from top down. 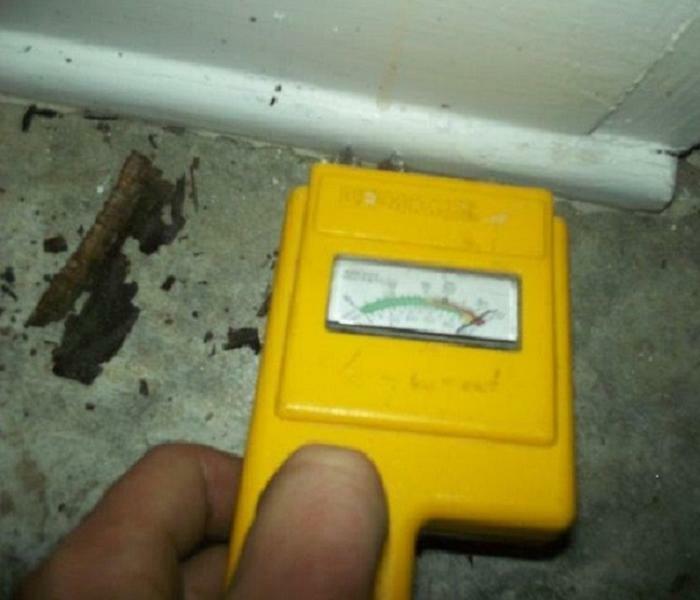 Its always good to see the meter reading "DRY" on the closing days of a local St. Petersburg water damage. 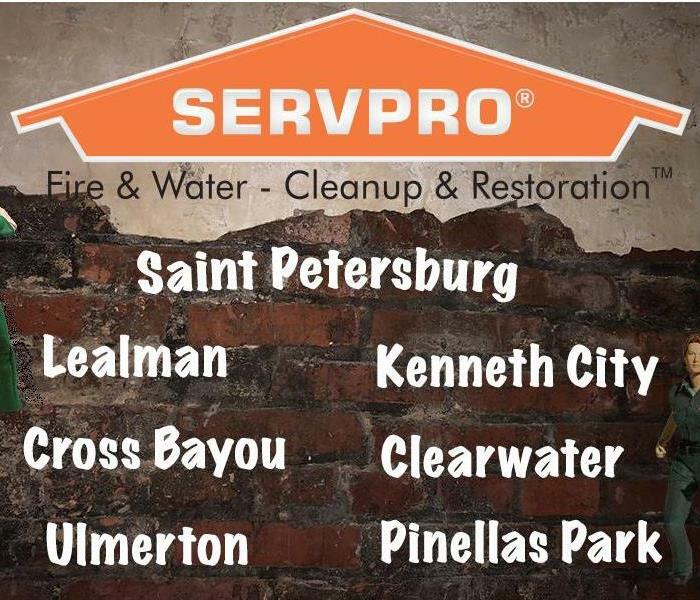 When disaster strikes call in the pro's at SERVPRO of Central St. Petersburg & Pinellas Park. Large commercial fire in the Pinellas Park area. 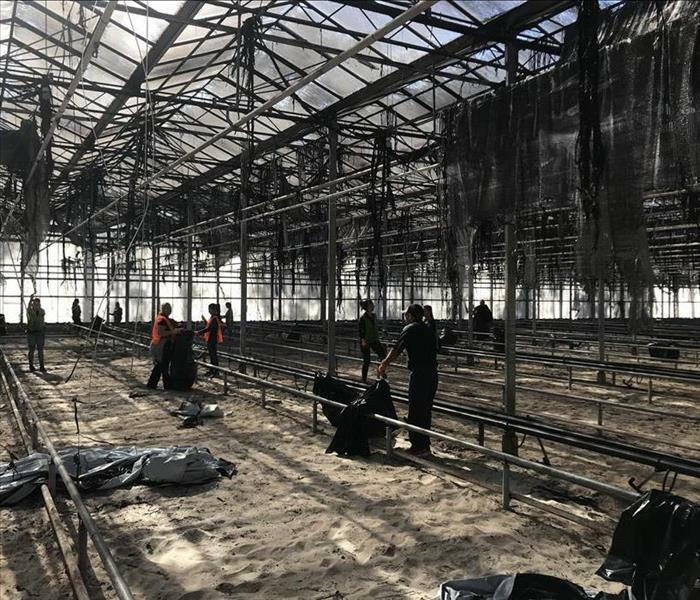 The fire was located in a large greenhouse. The crew had to clean all of the structure from top to bottom to make it "Like it never even happened." We love our community in around the St. Pete area. SERVPRO can handle any size disaster. 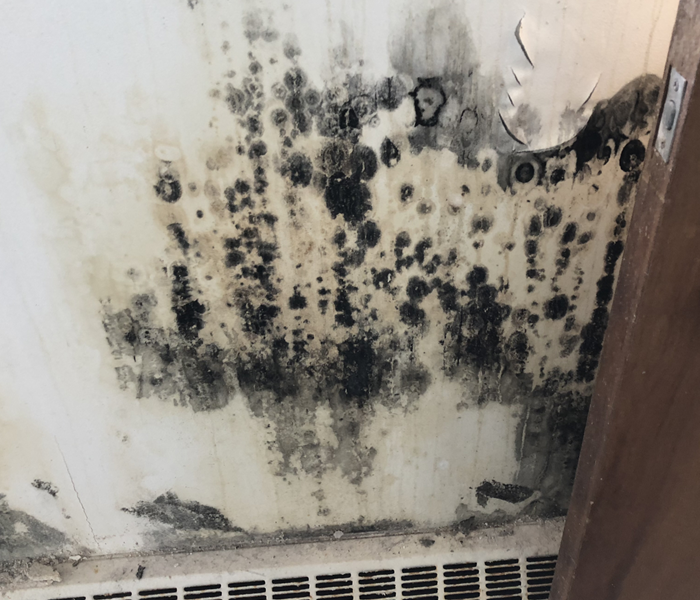 This unsightly mold blight was remediated by our crack Applied Microbial Remediation Technicians, AMRT, following the best practices of the LLCRC. Trust SERVPRO to restore order, cleanliness, and safety to your structure following a mold outbreak. The pressurized supply line burst and pooled a sufficient volume of water onto the flooring to require us to remove the drywall. This porous material soaked up the water and was not salvageable. Our drying equipment rids the excess moisture from the affected area. 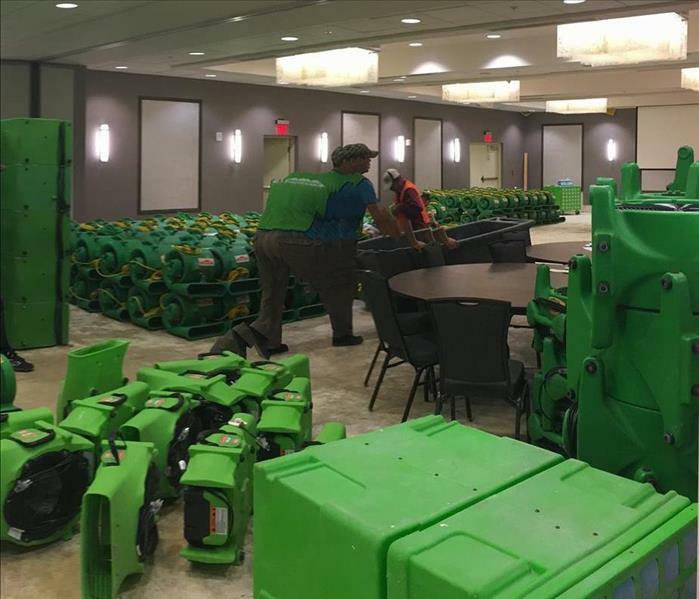 As part of our network of SERVPRO Disaster Recovery Team, a vast amount of equipment and manpower is available to move out and assist with most natural or manmade disasters. Many years of service have honed this operation into a formidable force to deal with any situation in the recovery industry. Count on SERVPRO. 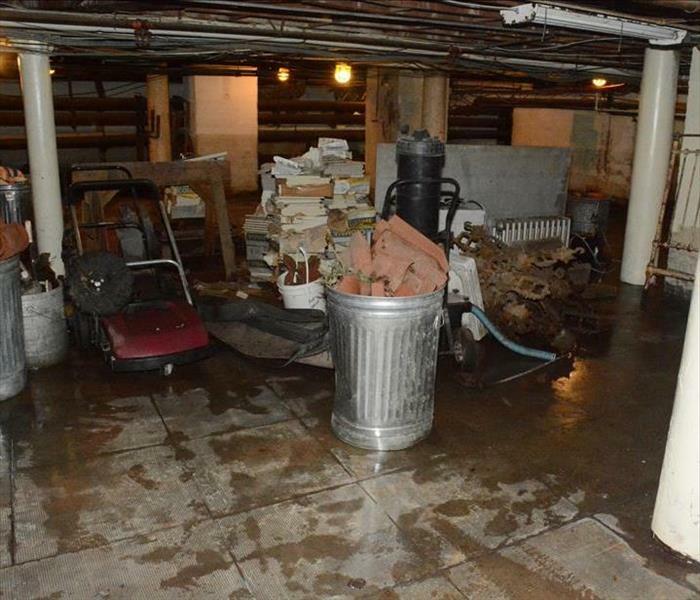 The rainwater flowed into this below ground level of this storage area in a St. Petersburg condo building. Our SERVPRO technicians worked around the scattered debris that was picked up, mainly roof tiles and other debris, to dry out the floor and then to move on to the first-floor level. Storm Damage at this St. Pete Beach facility created a massive amount of water damage when high winds shattered exterior windows allowing wind-driven rainwater to flood several floors. The SERVPRO disaster response team was utilized to apply their considerable expertise and resources to the recovery effort. No matter what size disaster might confront you, SERVPRO of Central St. Petersburg/Pinellas Park will be standing by 24/7 to help. Call (727) 521-2562 if you need us. 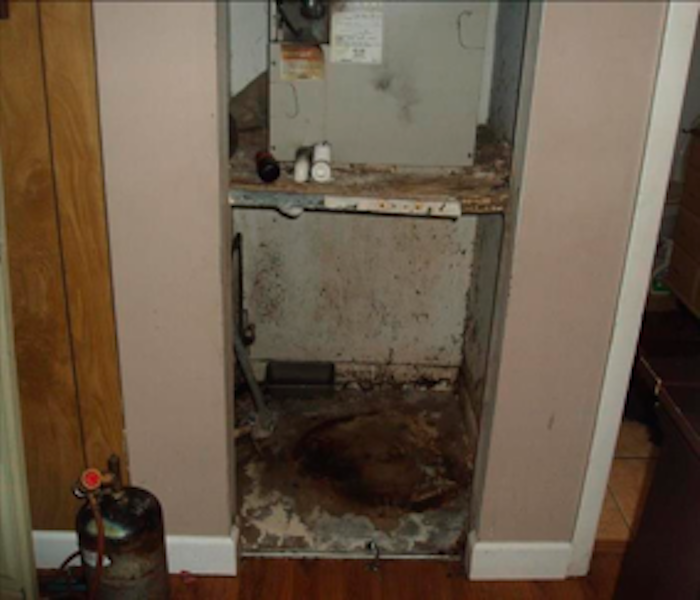 Mold damage occurred at this Pinellas Park home around the air handler closet. 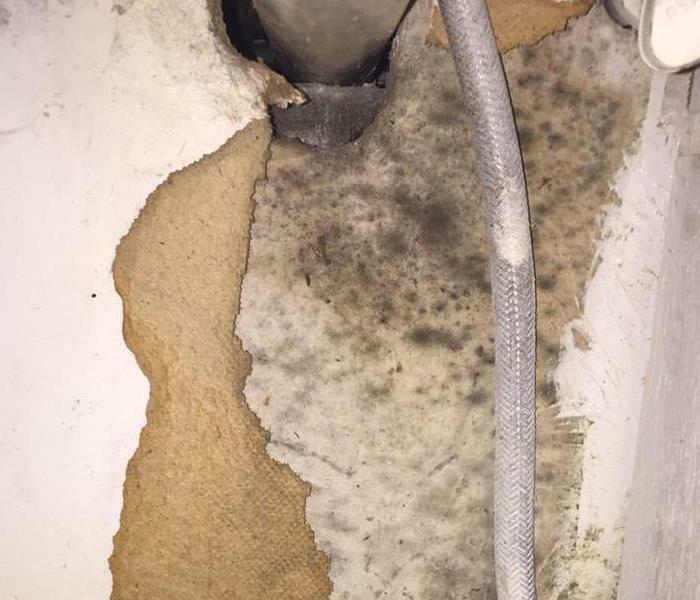 Water damage from a leak in the AC system provided ample moisture in the dark space for mold spores to multiply. Household mold removal related to cooling systems is all too common. SERVPRO has proven products and procedures to get rid of mold, and we are ready to correct the damage caused by mold damage whenever called. If you encounter mold at your home or business call SERVPRO of Central St. Petersburg/Pinellas Park at (727) 521-2562. 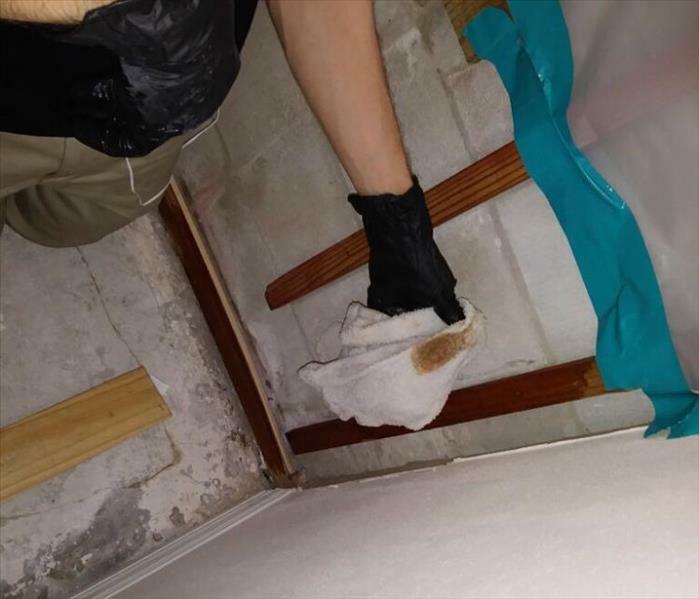 When water damage is discovered in St. Petersburg, we can readily see the wet walls, wet floors, and wet ceilings. But, we also want to detect moisture buildup that is not so visible. SERVPRO of Central St. Petersburg/Pinellas Park Professionals utilizes modern high-tech devices like the one in this photo. 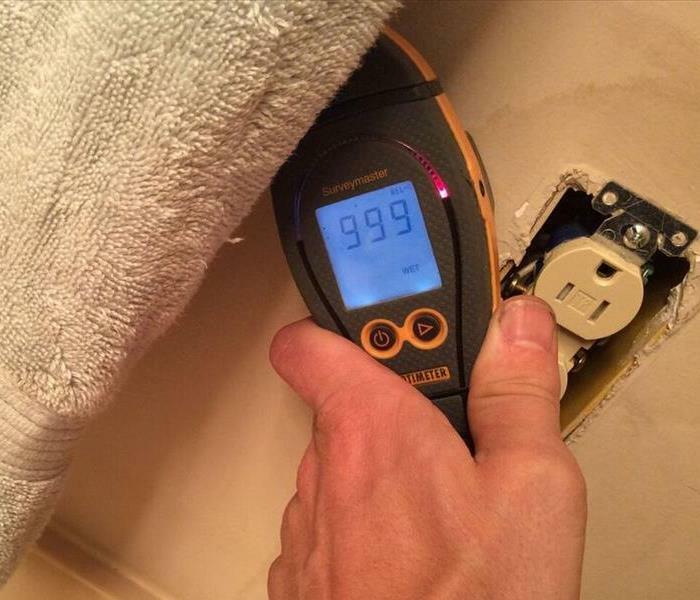 A moisture meter is shown being used to detect the degree of saturation in the molding on this wall. 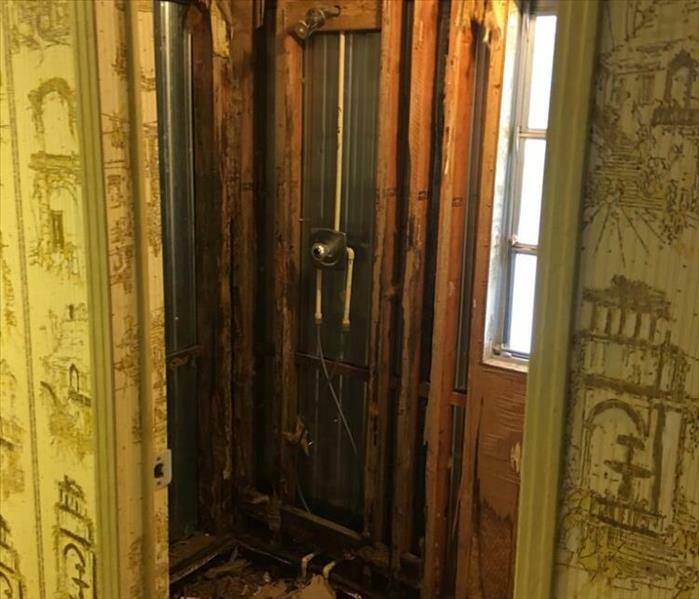 If you encounter water damage, get the latest technology available for your restoration by calling SERVPRO of Central St. Petersburg/Pinellas Park 24/7 at (727) 521-2562. We are open 365 days every year. We are open 24 hours every day. We are open now. Flood Damage occurs all to often in our area and sometimes requires a great deal of equipment to clean up the St. Petersburg water damage. This large commercial generator powers multiple water damage extraction units drying, and humidification equipment. SERVPRO Florida Franchises have access to a Large Loss Disaster Recovery Team with the equipment to handle any size disaster. If flood damage impacts your home or business, call SERVPRO of Central St. Petersburg/Pinellas Park at (727) 521-2562. We are open every day of the year. We are opened every day of the week. We are open right now. As in most fire damage restoration projects, this Seminole home was left with smoke and water damage in addition to that of the fire. The human element is often more difficult to repair than the structure. It is very difficult for a family to see their home and possessions go up in flames. We will apply all the SERVPRO cleaning methods to restore as many of their belongings as possible. After inspecting the structure and establishing a project plan we pack-out everything that can be restored. We photograph, inventory and label all items and take them to our facility for restoration. These items are then out of harms way once the clean up, fire damage, and water damage is addressed. The smoke damage in the photo will be removed with specialized equipment and the residual odors will be removed with commercial air scrubbers. SERVPRO of Central St. Petersburg/Pinellas Park Professionals has been trained in fire damage restoration. Call us if you need help 24/7 at (727) 521-2562.